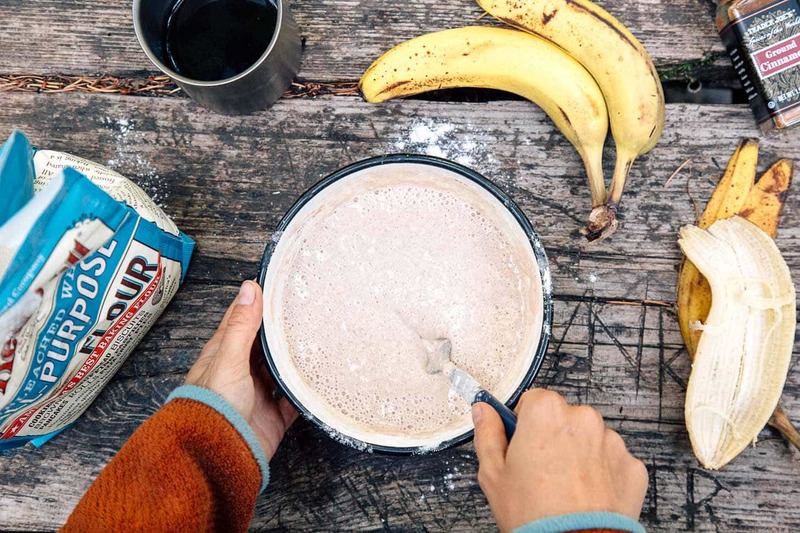 Add some banana, walnuts, and a scoop of brown sugar and you can turn your ordinary pancakes into delicious, perfectly sweet banana bread pancakes. 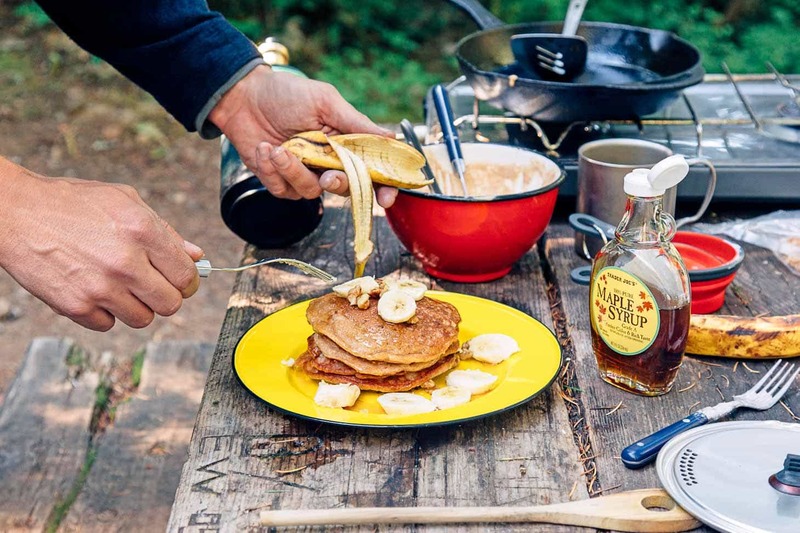 When you wake up, crawl out of your tent, and find out that somebody is going to make pancakes, you know it’s going to be a good day. In many ways, pancakes are a statement of optimism. They’re a mini-celebration; a way to greet a brand new day. They’re like saying, “Today is so special I’m going to make a cake, for breakfast.” It’s amazing how a little early morning positivity can affect the course of the day. 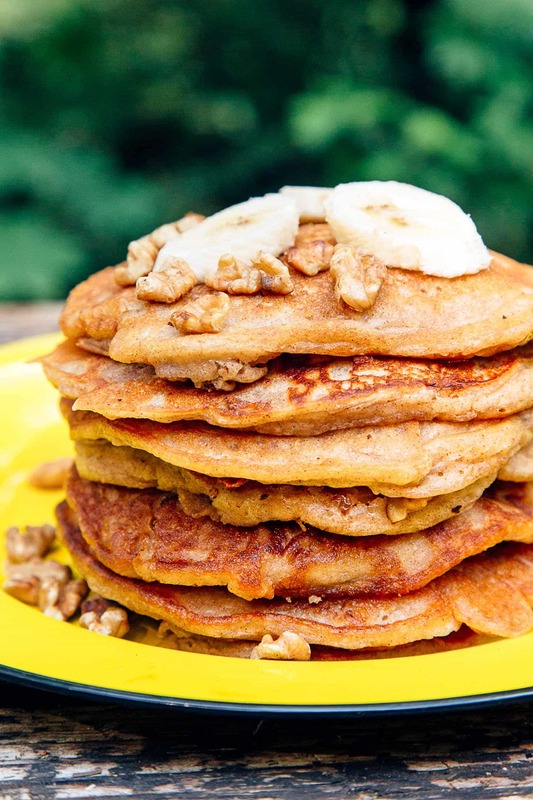 While all that can be said about most types of pancakes, these Banana Nut Bread Pancakes take things to the next level. By adding in a mashed banana, some toasted walnuts, brown sugar, and a hint of cinnamon to the batter, these pancakes are filled with a warming, wholesome flavor. Like a warm loaf of banana bread coming straight out of the oven, these pancakes offer a wave of comfort and nostalgia with each bite. The great thing about these pancakes is that they aren’t that hard to make. At home, you can combine all the dry ingredients together into a sealable container. All you need to do at the campsite is combine it with the milk, eggs, and banana. As with actual banana bread, a slightly kicked-around, over ripened banana works best (which is probably what will end up happening anyway if you’re camping). So the next time you want to start the day off right with some pancakes, consider kicking it up a notch with this Banana Nut Bread version. ‣ Our favorite fat to fry pancakes in is ghee. Plain old butter has a very low smoke point and has a tendency to burn (especially by the time we get to pancake number six or seven). To avoid this, we use ghee instead of butter, which has a higher smoke point and acts more like oil (while preserving that buttery taste). You can find it at Trader Joe’s, well-stocked grocery stores, or even online. Bonus: it comes in a jar, so you don’t have to worry about a stick of butter squishing around your cooler! If you can’t find it, coconut oil also works (use refined if you don’t want the coconut flavor). ‣ Be sure to use a good nonstick skillet or a well-seasoned cast iron skillet or griddle. 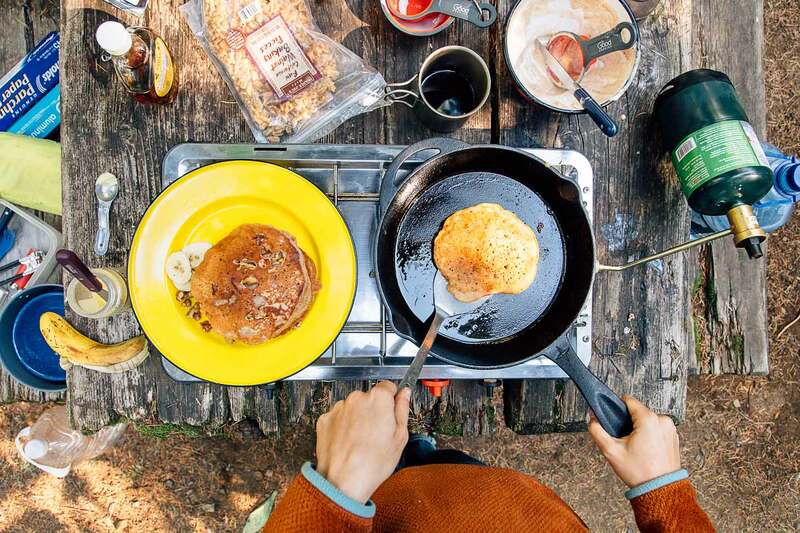 If using cast iron, be very generous when oiling the surface – since the banana caramelizes a bit as it cooks (one of the reasons these pancakes are so tasty! ), they can stick a bit when you try to flip them. We had no issues in our nonstick skillet but found if we skimped on the ghee in the cast iron the pancakes didn’t release as smoothly. Place the banana in a medium bowl and mash thoroughly with the back of a fork until fairly smooth. Crack the egg into the mixture and add in the milk. Beat the banana, egg, and milk together until smooth. Add the flour, brown sugar, cinnamon, baking powder, and salt to the bowl and mix until well combined with the wet ingredients. Don't overmix - some small lumps are OK.
Heat a nonstick pan or well-seasoned cast iron skillet on your stove over medium-low to medium heat. Add a generous dab of ghee, butter, or coconut oil (especially if using cast iron!) and swirl to coat the pan. Pour ⅓ cup of the pancake batter into the center of the skillet and scatter some of the chopped walnuts on top. Cook for a few minutes until the top begins to bubble and the sides are set (2-3 minutes). Using a spatula, flip the pancake and cook the other side until golden. Repeat with the rest of the batter, adding more ghee or oil to the pan for each pancake as needed. 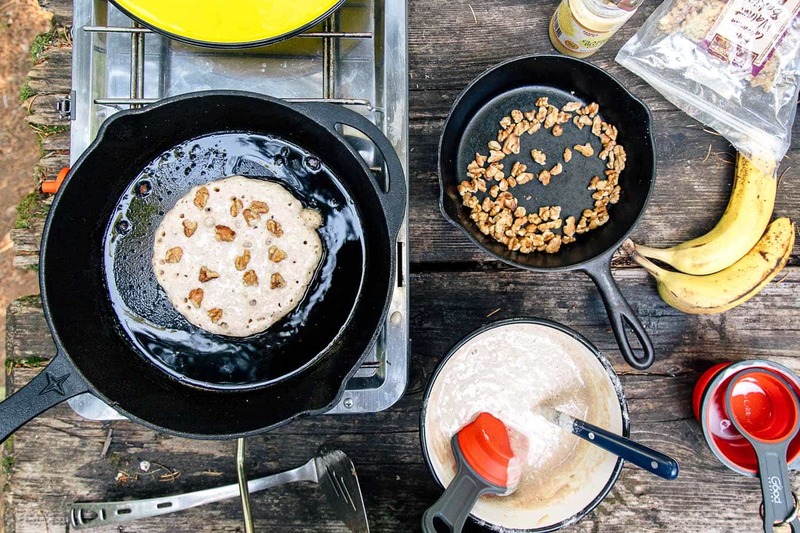 To serve, stack the pancakes and top with maple syrup or butter, sliced banana, and additional toasted walnuts. Enjoy! Measure & combine the flour, brown sugar, cinnamon, baking powder, and salt in a resealable bag or container at home. Pack the banana, egg, milk, and walnuts separately. Pancakes are one of my all-time favorite foods. 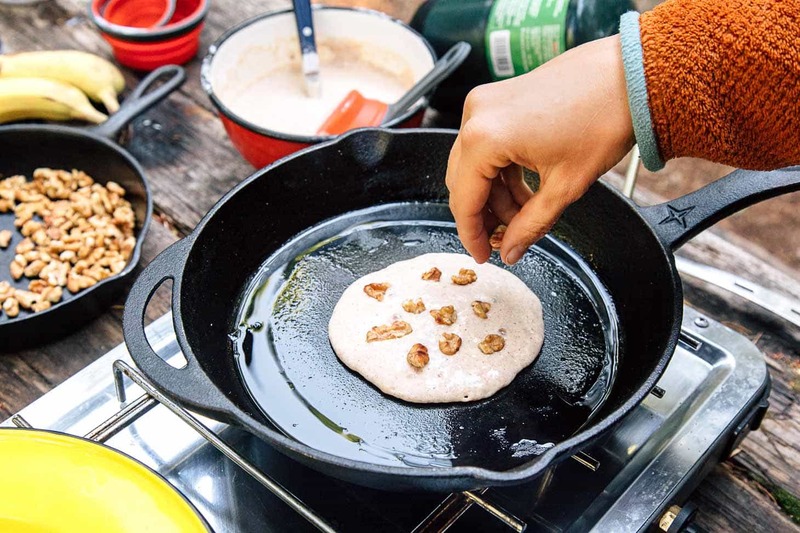 I love the idea of making them while camping – Especially with some freshly brewed coffee! Banana bread is a favorite when we are looking for comfort foods…. the idea of making them into something like pancakes just make me happy… and I know it will make the family happy when I make it on one of Sunday Morning Breakfasts! This looks so delicious! Perfect for a camping trip! Yum! Banana bread pancakes sounds so delicious! Love that you added walnuts too for extra flavour and crunch! 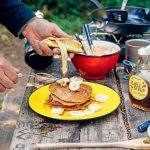 I so love pancakes, my husband makes them for me, so I am going to ask him to make these banana bread pancakes and we’re going to get the ghee to fry them 😉 . Yes to walnuts! !